As nice as it would be to have a studio full of top-end expensive and classic microphones at our disposal, for many of us it is just a pipe dream! But thanks to the ever-developing technology these days, there are so many affordable mics available to us that you don’t have to break the bank to get a decent sounding recording anymore. Even when buying them brand new, many microphones will be quite affordable and again even cheaper if bought second hand. 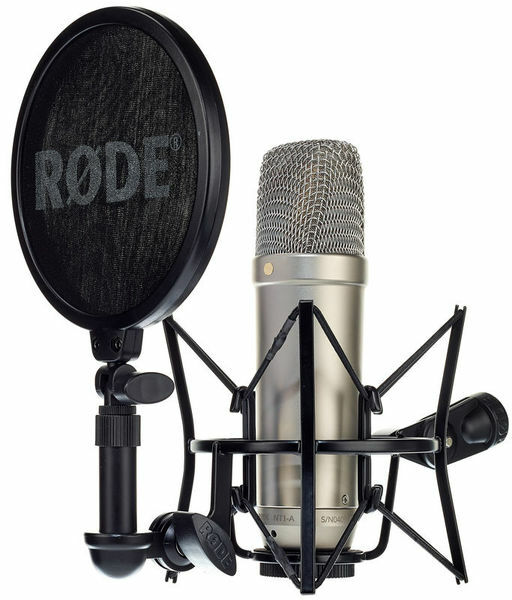 Weather you are a home-studio hobbyist or a seasoned professional, many of the mics mentioned in this blog post you would most likely have come across at some stage or at least know the names! 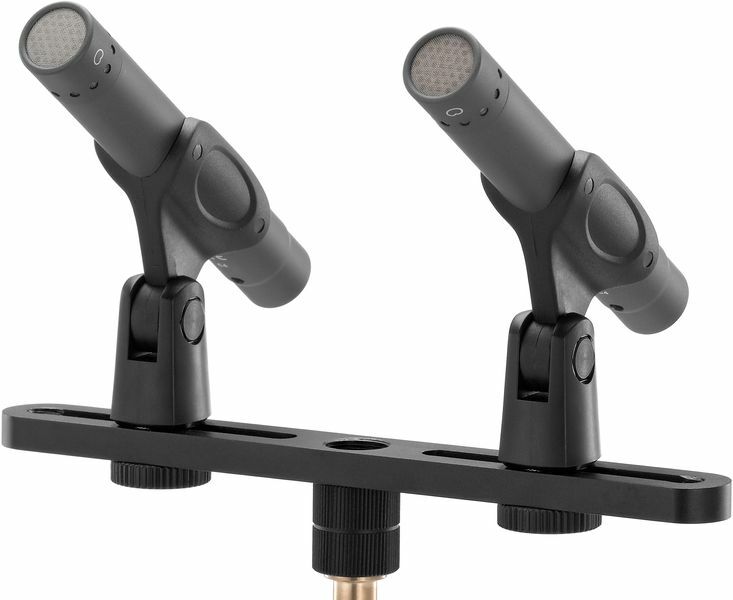 So with that in mind, we are going to be looking at a number of microphones that are available to us for under €400 new. When we are choosing what microphones to purchase for our studio there is a number of different elements that we should take into account. Yes, you can spend over €10,000 on a U-47 from Telefuken which is all well and good, but it would be down to how you handled the recording at the end of the day. Every aspect of the area you are recording in comes into play, the room, acoustic treatment and baffling are all things to consider so make sure you know what you’re doing! The web is full of useful guides from learning where to start with acoustic treatment to advanced practices. As for our mics, they come in many different styles and sizes so if you’re new to the game make sure to check up on what exactly it is you are looking for. The main types of microphones we are dealing with are large & small diaphragm condenser mics, dynamic mics and ribbon mics. Others you may come across are USB mics, shotgun mics and lav mics. Let’s talk about types of microphones, so we have large and small diaphragm condenser microphones, what does that mean? Well, usually “large” means the microphones capsule’s diaphragm (or membrane) inside the mic is 1 inch or more in diameter. While “small” means the mics capsule’s diaphragm is 1/2 an inch or less. This is not always the case however as some small diaphragm capsules are bigger and some large ones are smaller! But that is the idea behind the name. Condenser microphones are much more sensitive than dynamic mics and because of this we need the correct amount of power sent to the microphone to power it and this is 48 volts of phantom power. Despite adopting the name dynamic, one might think that this has something to do with the dynamic response or dynamic performance of the microphone but you would be wrong. Basically, a dynamic microphone has a moving coil within it and when a sound hits the membrane of the microphone, the membrane moves to the rhythm of the sound waves which moves the coil along with it. This process then converts the sound waves into electrical signals. Dynamic mics are known for being able to handle very high SPL’s such as a snare. Ribbon microphones use a thin aluminium or nanofilm of electrically conductive ribbon placed between the poles of a magnet to produce a voltage by electromagnetic induction. They are known to be quite delicate and can easily break, and definitely don’t send 48v of Phantom Power to them! Phantom power is used to power condenser mics so when you’re using both ribbon and condenser mics during a session, be weary of the fact that if you send phantom power to the wrong mic you could end up doing some serious damage! Now that you know what the different inner workings of each family of microphones, lets get into the nitty, gritty and see what we have in each section for €400 or less. Large diaphragm condensers will look familiar to most, fairly large in shape and usually supported by a cradle because of the weight they can carry. If you have ever seen a “In The Studio” with a band recording vocals, they will most likely be using a large-diaphragm condenser. They are known for being warm and well-rounded and being quite sensitive and can pick up the tone and clarity of a voice very well. They are also used extensively on guitar amps or cabinets in conjunction with a dynamic mic for tonal balance in a mix. A great versatile mic that sounds fantastic on acoustic guitar, vocals and guitar amps. Cheap compared to some of it’s counterparts. You can pick them up brand new for €105, I nabbed a second-hand one for €60 so shop around! Another entry-level microphone, but definitely not one to shy away from. Similar to the AT-2020, the NT1-A works very well on vocals and usually comes packaged with a pop filter and shock-mount for easy use. 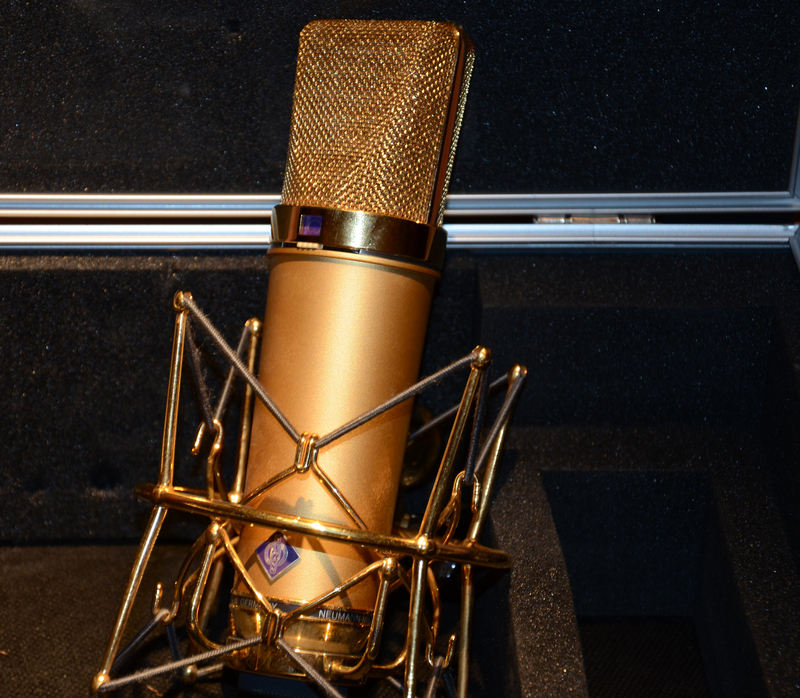 AKG are one of the main players in the audio recording game and the C214 microphone is one of their best to date. It was released as a cost-effective alternative to the already popular and quite expensive C414 which has multiple polar pattern selection. The 214 works very well on drum overheads, toms, and guitars. Next we have small diaphragm condenser mics. Smaller in size they can help provide easier set-up within tight situations e.g. recording drums. They can also be used on a variety of other instruments such as hi-hats, drum overheads, piano, strings and woodwind instruments. Our second RODE selection! The NT5 matched pair are fantastic for drum overheads, they work as a stereo pair so if you are experimenting with different microphone techniques such as X/Y or ORTF these fit the bill, and at only €349 new you would be mad not to have a set in your arsenal. A brand we will be seeing a lot of in this blog post. Shure mics are built like tanks and have the best reputation around the music industry for always delivering the highest quality sound reproduction. The SM81 sounds great on acoustic guitar and piano. But at the same cost as a matched pair of NT5’s is two better than one? Your choice but either way you wont have any issues recording with either. For the fantastic price of €379 you can grab a set of Studio Projects C4 MKII off Thomann, and even better they come as a stereo set! So you’re getting two mics for the price of one! With the accompanied stereo bar that will hold the mics in place, you’re pretty much good to go! Used for Drum overheads, choirs or groups of singers and piano. They come with omni & cardioid polar patterns. 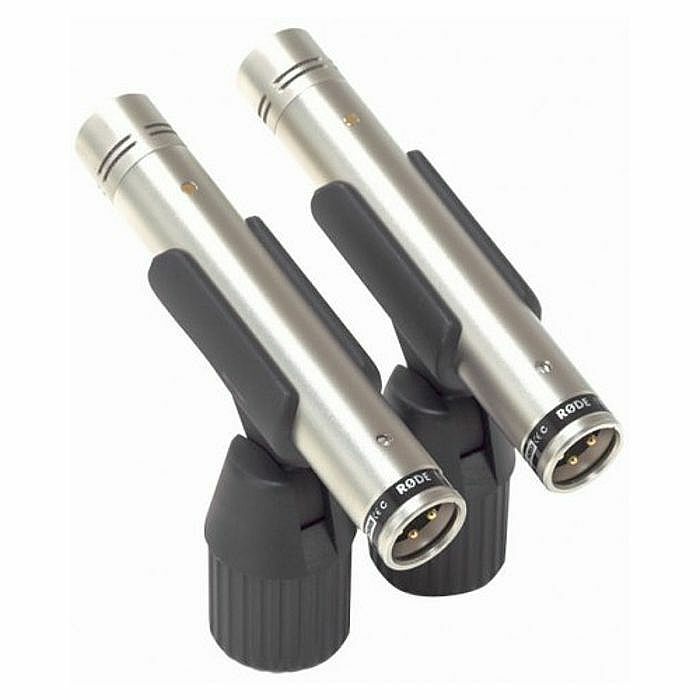 Moving onto dynamic microphones, dynamic mics are ones we will come across all the time whether we are in a recording session in the studio or doing live sound for a live performance they are the bread and butter of sound. They are the rougher brother of the condenser and ribbon mics as they can handle much higher SPL’s. They also can take 48v phantom power like its nothing, . Essentially just plug in and away you go! They can take a beating which is why they are usually used for live performances, a familiar face in this category is the Shure SM58 which is used mainly for live vocals, but artists have been known to use the SM57. They also usually have a more limited response than a condenser mic. 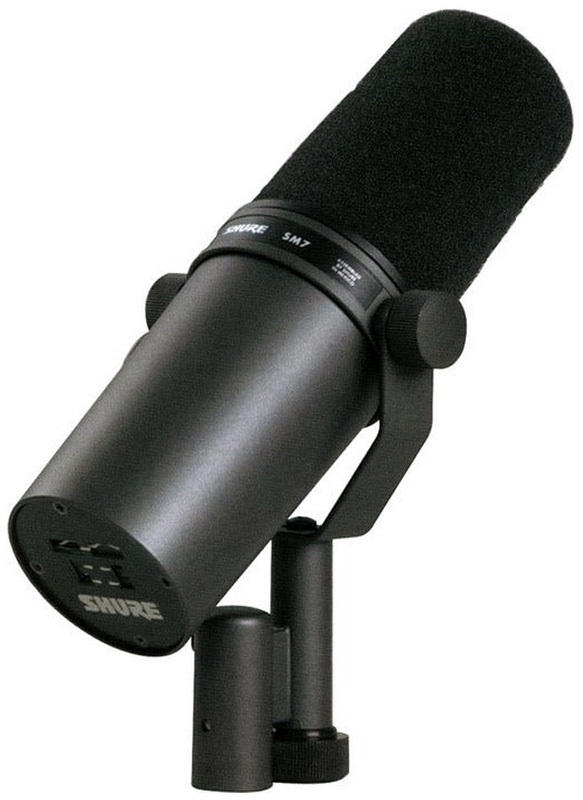 For studio work the Shure SM7B has become a part of many professional studios. Originally released as the SM7 in 1976 and is available today as the SM7B, notable users include Micheal Jackson, Metallica and Serj Tankian of System Of A Down! We don’t want to make the entire dynamic mic section all about Shure so just check them out for yourself and decide whats best for you, we like SM57 on guitar amps/cabs and snares for recording and live, while a SM58 for vocals will do the trick in a live situation and also a studio situation although to get nice crisp clear vocals for a recording we recommend the SM7B or some sort of condenser mic. the Beta 58a is also a top microphone. As mentioned before this has been a popular mic since the original SM7 came out in 1976, but was discontinued and re-released as the SM7B and has grown as a regular occurrence in many studios across the world (is known to be a favourite of Metallica . It is know for its flat wide-range frequency response and clean reproduction of voice or speech. Is used quite a lot in radio and television broadcasts also. 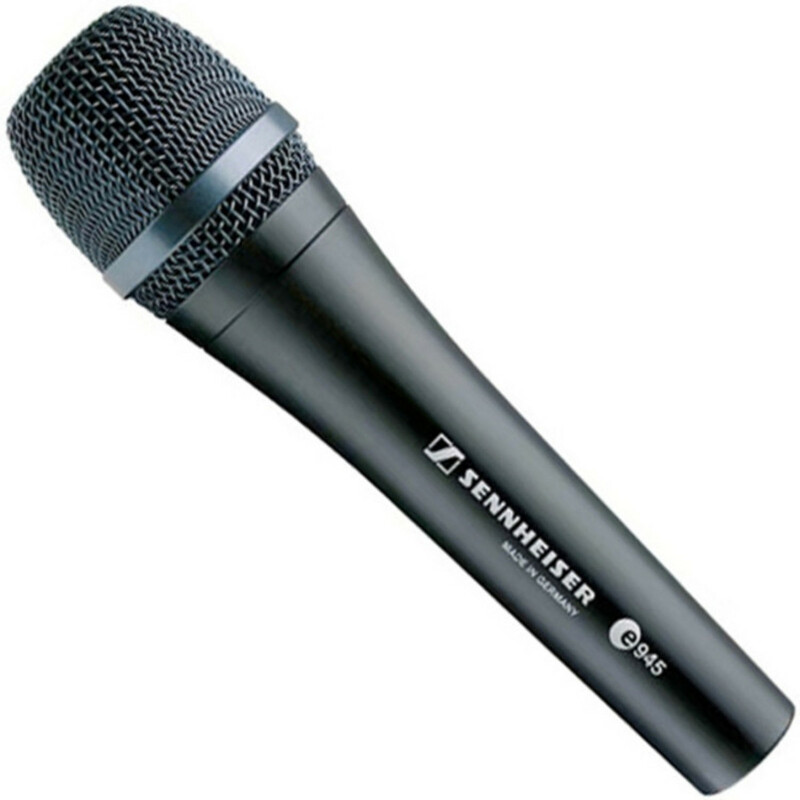 Sennheiser are another high-quality brand that have great dynamic mics. Our pick of the bunch is the E945 and at the pocket friendly price of €215 if it tough to beat. Very good for vocals, and notably rich and powerful in detail and has a super-cardioid polar pattern. 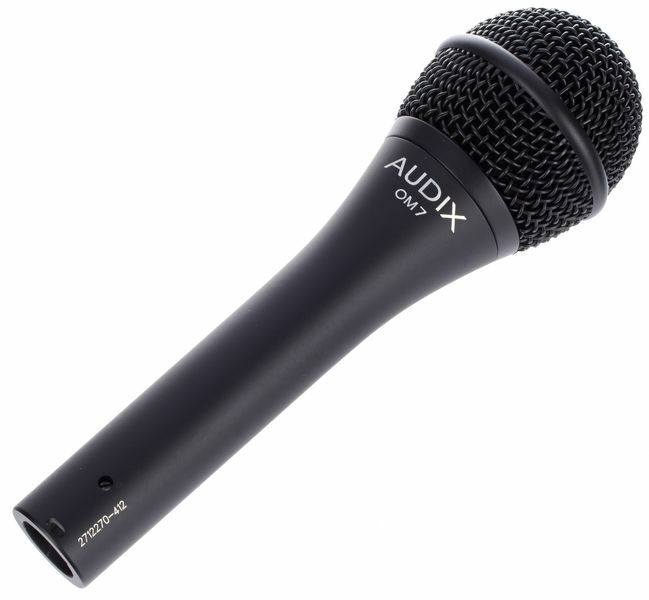 You may have heard about Audix before as they make some well known drum mics, in particular the D6 kick drum microphone which, in many studios has replaced the standard AKG D112. The OM7 however is their leading vocal microphone, built with a hyper cardioid polar pattern which has been proven to help with smaller spaces due to bleed from other instruments. Get yours for €199! Last on the list for us today is Ribbon microphones, known for their delicate builds and warm well rounded sound. One of the first things you learn in any music production or studio recording school is “DO NOT SEND PHANTOM POWER TO RIBBON MICS!” However this rule is not applicable to active ribbon mics, but still be wary as active ribbon mics will never be damaged by phantom power, but non-active ribbons will be! This is because when phantom power is present in a ribbon mic, it can cause the ribbon inside to stretch or completely blow, and nobody wants that with the microphone you just spent X amount of hard earned cash on! At one stage of their career ribbon mics were substantially more expensive than their other counterparts but with the developments in technology, they have become more affordable than ever. Ribbons are known for really representing the element being recorded better than any other microphone. One of their selling points is that other mics can’t accurately translate the complex harmonic and dynamics as well as a ribbon microphone can. Make of that what you will, but many will argue you can’t get better sounding mics that ribbons so we’ve compiled this list! 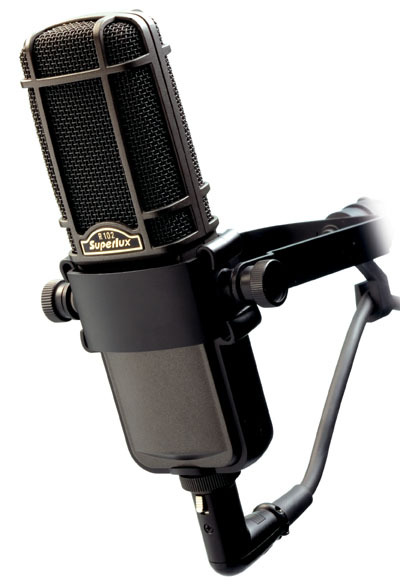 sE electronics are one of the most underrated microphone companies around. 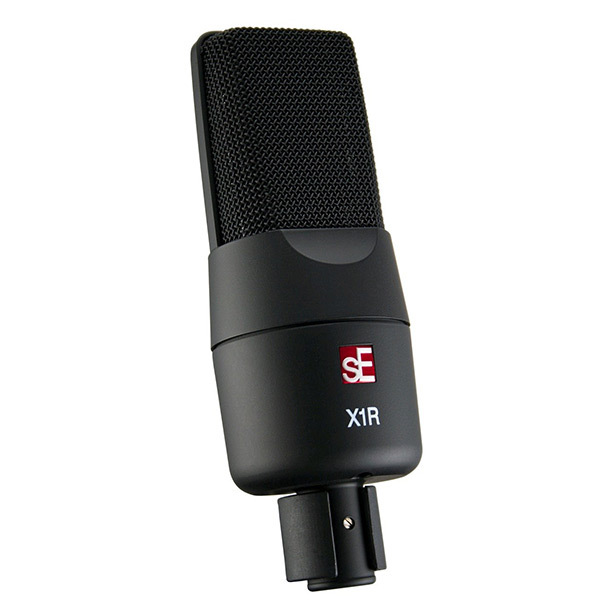 They boast a huge back catalogue of high-end mics at very affordable prices and have recently collaborated with Rupert Neve for a signature series and the X1R is one of the best ribbons the have. The X1R gives off powerful low-end response, and is versatile and durable for use on any element. Another fantastic brand that boasts some seriously great stuff is Superlux. 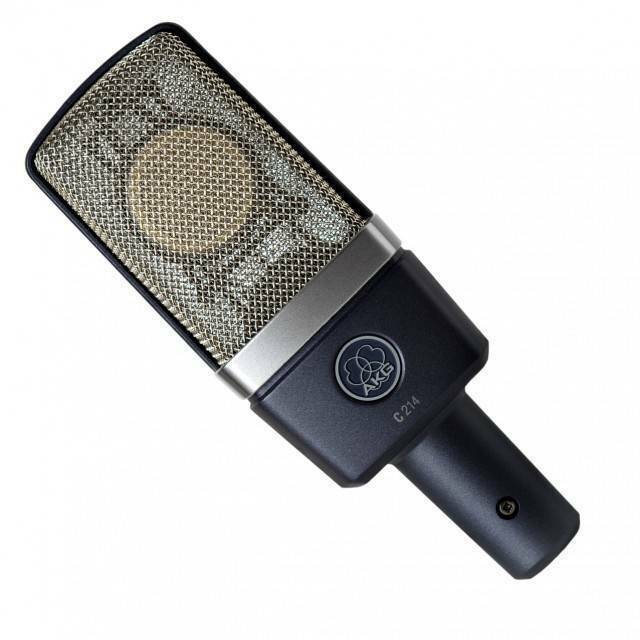 Although some may think they are a cheap Chinese knock off brand, the R102 is known for it’s warmth and figure-of-8 characteristic and is also an active ribbon microphone. An active ribbon mic means that it doesn’t matter what type of pre-amp you use with it it will work, ribbons in the past have been known for not computing with certain pre-amps but now with active ribbons this is not an issue. The R102 requires 48v phantom power. 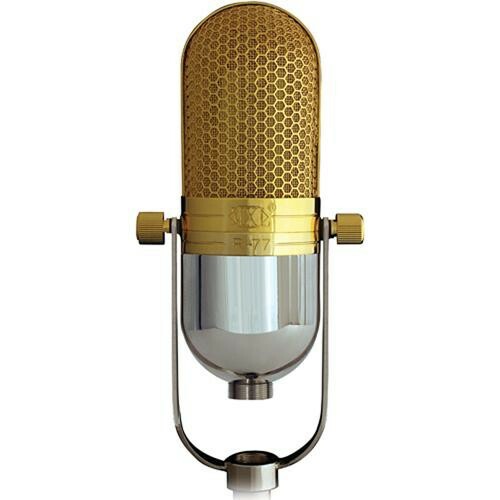 This beautiful mic in both sound and looks with its gold & chrome finish features a figure-of-8 polar pattern to help capture the instrument and the space it is recorded in all at once. Boasting extended upper-range sensitivity, robust low-end and a full midrange. This mic is one ribbon microphone suitable for first time users or seasoned professionals alike. So there you have it! 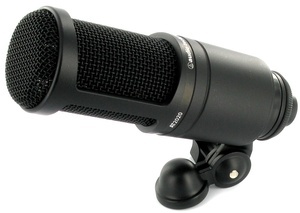 A wide selection of very affordable microphones under the price of €400! Any and all of these microphones would be an exemplary addition to any home studio, be it professional or hobbyist, we highly recommend experimenting with a number of different mics on whatever element you’re recording. Blending the mix of a dynamic mic and ribbon mic on a guitar cab for instance can sound exceptional, but of course its all depending on what sound you or your client in looking for.